We have an awesome $300 giveaway with our longtime friends over at Petit Collage! They have such great nursery items and have really been bulking up their toy collection as well! Petit is also so kind to offer a huge 20% off for readers “smallfry14” all the way until the end of the month! Here are some of our favorites, find your own faves on their site! Pop-out toy families, cities, animals and more! Mobiles, puzzles, blocks, and art! We’ll pick a winner next week (just in time for Holiday shopping!) and don’t forget to use that awesome 20% discount. Good luck! I adore the whale mobile! Would be so cute over my daughter’s changing table! I like the wall decor, especially the wood map! I’d buy my baby toys and give her a great Christmas! I love their mobiles or prints for a nursery. I would love the Safari Jumble! Id get one of those amazing mobiles! I would love to get a framed print, wall decals and toys. Would love to buy christmas presents from here. This would be great for my 3.5 year old for puzzles and books and then I love a mobile for my little guy due in 3 weeks. I would get something for each of my nieces and nephews, starting with a set of Ocean ABC nesting blocks for my youngest niece. I would get the framed art for my son’s room. It’s absolutely beautiful. I’d buy all the cute little nursery items for my niece-to-be! Crazy about all the wooden toys! That mobile is to die for! Love all the wood products! My first baby is due next May! We don’t have anything for his nursery yet, so this would be an awesome treat! Two mobiles, one for my son and one for my nephew! These would make gorgeous Christmas gift. Love it all! I’d buy any and all baby toys! This would be perfect for my December baby due in 2 weeks! I love all the puzzles and bamboo toys. Adorable! I would buy nursery items for my 7 month old’s incomplete nursery! Plus Christmas gifts for my 3 year old! Hope I win!!! I love them all! They’re so stinking cute! I love the wall art! especially the wooden map. Aaaahhh! So many cute things I could spoil the new baby with!! And my toddler would love the puzzles, matching game, and the mask kit. Love the little wooden push toys for my two older boys and a mobile for my new baby girl! I’m loving the memory games, and all the wooden toys! I would buy toys for my nieces!! i love petit collage! what a great giveaway! The matching game and the growth chart to start. I would use it for gifts! I love in Laredo, Texas because of my husband’s job and there was a baby boom this year! I have 10 friends with babies roughly the same age as my 11-month-old. No joke! The mobiles are amazing. I would definitely buy some wooden toys for my baby boy!! Such cute stuff! Thanks for a fun giveaway! I would buy Christmas presents for all my nieces and nephews! Love the sky bamboo mobile! This would all look great in our new nursery!! Love the Safari Friends Mobile! I love the little cities! I love the mobiles! And the wooden animals are darling. I have a toddler and the push toys look like something she’d have so much fun with! wooden animals for my daughter that is turning 1. The pop-out cities are so cute! I love the Starry Sky mobile, their bamboo toys, and the By Air beginner puzzle! Such adorable pieces! toys! Any toys! we don’t have anything besides a little giraffe carseat toy we bought! & our little one is getting to the stage where she wants to start playing, we need to get some toys, stat!! Dolls! My daughter would love these sweet dolls! You ladies are the best. Fabulous companies with fabulous things, my friends and I trust your opinions and love what you guys find. I could definitely find some goodies for my little boys at petit collage for the holidays. Thanks!! Puzzles! I’d stock up on baby shower gifts as well! I would be so excited to spoil my kids with this gift card! It’s hard to pick one thing. It’s all so great!! The dolls (CURIOUS CAT!!!) and stationary are my favorite! i would love a Funny Bunny for my daughter.And a monkey print for my niece! Thank you! What great ideas! I am in need of some toys for Christmas for my 17 month old. I feel stuck, either things are too baby, or too big kid. So these items would be nice to get her some ‘out of the box’ toys! I love all the blocks and puzzles! I love all their puzzles for my little guys…yep, definitely eyeing the All Aboard floor puzzle now. Thank you for the adorable little giveaway! I absolutely LOVE petit collage! My daughter loves the “You Are My Baby” books and the “In My…” books. 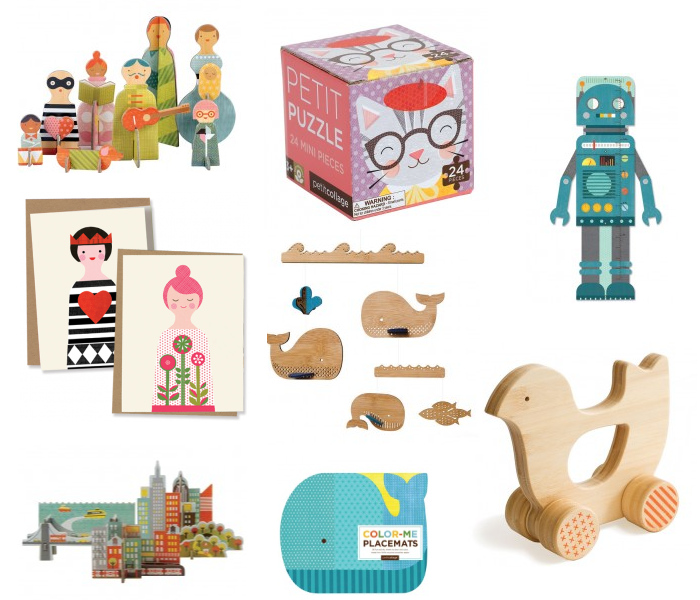 If I won the gift card, I would love to buy the Woodland ABCs Nesting Blocks, Bamboo Bird Push Toy, In the Garden Alphabet Art A-Z Cards and the Forest Friends Wood Puzzle + Play. Thanks! I would love the whale mobile for my 4 day old baby’s new room! Love the wooden baby toys. Much nicer ti look at. I would love to win this! I have a little one coming in March, our first, so I am excited and would love to have cute toys! I would get one of the framed prints! They are gorgeous!!! The prints of the cities have always been my favorite! Oh man this is my dream giveaway so cute!! I’d definitely get the beginner puzzles. I would buy all the wooden toys for my baby girl. They are so pretty! Love that whale mobile – my baby son would love it too! Oh the starry sky mobile in bamboo is perfect! The little stuffed animals, curious cat, mr. Monkey and funny bunny are adorable. My daughter would absolutely love them! I love the whale mobile! This would be perfect for my baby boy due in April! Love the pop up cities. Such a fun idea. So many of their cute toys!! I love their little choo-choo train guessing game! I would get that and a few other puzzles for my daughter because she loves them! It’ll be hard to choose but the wooden toys look great. I would buy the personalized art mermaid and a doll. Everything is so beautiful! Great giveaway! My first baby was just born on November 10 – I would use the gift card to buy her gorgeous and fun wooden toys! Gosh, tough decision. Toys for my son and stuff for my new baby. Love the robot! I would buy the Up In The Air Mobile…amongst other adorable things! I never bought a mobile for my son’s room because I couldn’t find one that went with his room aesthetic. I love the options on Petit Collage! i’d lovethe pop out cities or wooden animals. So cute! Hi! I’d love the World Map fabric decals and the Petit Collage 25 Easy Craft + Decor Projects For A Playful Home book. I would love to win so I could buy every single pop out toy! I love the Tree Growth Chart! The wall decor is beautiful! A mobile for my daughter who is coming in February and gifts for my nieces and nephews! I would start with the woodland wood mobile – I have registered for it for my little man’s arrival on Amazon and would LOVE to have it! Then I would splurge on toys for my older two (3 &1.5) and teethers for new baby boy! I love their products, so cool! I’m going to have to christmas shop now! I would buy my daughter the adorable mix and match cards and the alphabet cards! Play and learning have never been more beautiful! Well of course I forgot my name, haha. I love the curious cat doll. I adore their Starry Sky mobile and their bamboo toys. They have so many amazing products it makes it hard to choose! The curious cat doll is great as well as their bamboo toys. I love all the wood art and mobiles. Love their stuff so cute!!!! I love all the small wooden toys for babies! Such cute stuff! I’m in the middle of doing a nursery for my baby due in February. I’ll have to use some of this stuff! I would buy my kids a bunh of christmas presents and buy some for their cousins too. I would buy my kids a bunch of those gorgeous sodden toys! I love wooden toys! I would definitely get some for my babes. I’d choose wooden toys and puzzles. Wonderful giveaway! Thanks for the chance! I’d get the Treetop Friends Floor Puzzle, Mr. Monkey and Funny Bunny dolls, and the Blue Robot Growth chart for sure! Awww! I would definetely get our luv bug on the way the super cute “red elephant” babboo mobile for her nursery… LOVE it so much! Those placemats are so cool! i love the wood map. I would buy gifts, for my nephews & friends kids. I have been eyeing that world map decal for a whike! The world map decal and the bird mobile! Deluxe Bamboo Mobile! So cute! I love the Mobiles! Adorable! I’d love one of the growth charts… and maybe a map! !